art / D.I.Y. / Words. Craft Your Costume with Tips from TUBE. If you are lacking motivation to find a Halloween costume this year, look no further! We’ve put together some cheap, cheesy and super easy ideas for you. Take a look and find your creativity within your very own closet. Good thing these white collar dresses are coming back in style. We love them and they make a perfect Wednesday from The Addams Family costume. Throw your hair in some braids, put on that pout and head on out. It may look complex but it’s actually quite simple. You will need some basic sewing skills. Simply cut a dress in half and a men’s shirt and sew them together! It may come out a bit janky but that’s what makes it unique! Draw on a fun face and grab your dancing shoes! Half-Man, Half-Woman Hottie. Photo Sarah Elliott. 2015. Burgled by Beauty. Photo Sarah Elliott. 2015. Everyone has a black and white striped shirt of sorts so grab a cheap mask at the dollar store and throw a dollar sign on a pillow case before your off to burglarize your friends. Vampire Vixen. Photo Sarah Elliott. 2015. Goth it up with this easy costume. Fur coat, chandelier earnings and maybe a fun red wig to match! Vampire teeth sold separately. Mad Men Mega Babe. Photo Sarah Elliott. 2015. 70s Dancing Queen. Photo Sarah Elliott. 2015. Star Wars Groupie. Photo Sarah Elliott. 2015. Climb through the television and the decades with this Mad Men-inspired costume. This one is quite simple with the abundance of hip vintage shops around town. Or you might just have a vintage piece in your closet like we did. Throw your hair up in a beehive and boogie! Afro wig? Check. Bell bottoms? They sell them everywhere right now and they are cheap and overly patterned which works perfectly with this idea! You could even throw on some roller skates! With the abundance of Star Wars things EVERYWHERE it’s really easy to get your hands on an R2-D2 nighty. Bam! Done. Get wild! Get crazy! Smash a few guitars, it’s Halloween! Throw on a long wig, bandanna, a ripped up band shirt and tie a flannel around your waste. And please, don’t forget that the handlebar mustache is a must! Little Wendy Darling. Photo Sarah Elliott. 2015. Frightful Freddy. Photo Sarah Elliott. 2015. Something simple and family-friendly? We’ve got just the thing. Find a pretty little blue dress and a ribbon and you’re done! Then dress the kids as the lost boys so everyone gets it. Freddy Krueger has a passion for his fedora. Oh, and he enjoys knives and stabbing as well! Grab a red- and grey-striped shirt, dark gloves and a few butter knives and you’ll be ready to slaughter the city. Love The Walking Dead? Then there’s are huge chance you might also have a thing for mega-hunk Norman Reedus as well. So do we! For this one we put a little extra work in. 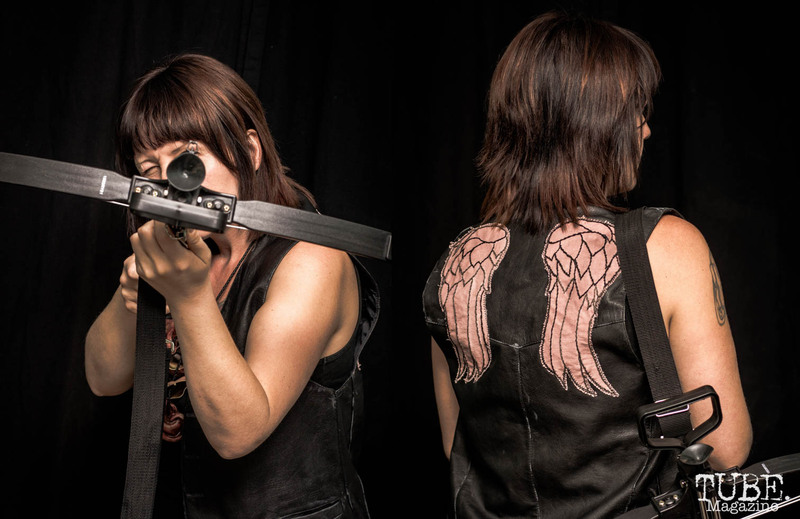 What you’ll need: A used black leather or pleather vest, wings for the back and a crossbow (real or fake). This vest has the wings cut out of fabric and stitched on but you can easily paint or pin them on. We also got a zombie ear necklace for pretty cheap and our local Halloween shop. Throw it all together, rub a little dirt on and you’re ready to slaughter some walkers! Scarecrow, Yo! Photo Sarah Elliott. 2015. Here’s another costume that won’t freak the kiddos too much. You can obviously go darker on this one if needed. We used a straw hat and a little crow from the dollar store. Then grab a warm flannel and go hang out. Bloody up your white collar shirt and do your nose too while you’re at it. A little powdered sugar and a fake syringe go a long way in this super easy get up. Pulp Fiction Mission. Photo Sarah Elliott. 2015. Batgirl. Photo Sarah Elliott. 2015. This little piece will need some sewing skills. Basically it’s a grey top with the Batman sign sewn on. Grab a miniskirt and grey tights and go fight some crime. 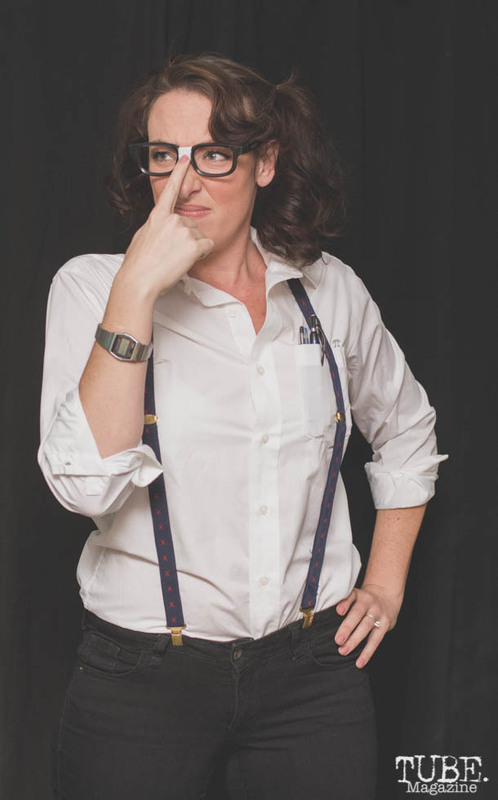 Nerdy watch, suspenders, taped up glasses and a ridiculous amount of pocket pens make this costume fun and quirky. Who doesn’t love a nerd? Photos and words by Sarah Elliott. We want to see your costumes! Make sure to tag us and use hashtag #TUBEaween on social media. Find us on Instagram @TUBEmag, Twitter @TUBEmag and on Facebook as TUBE. 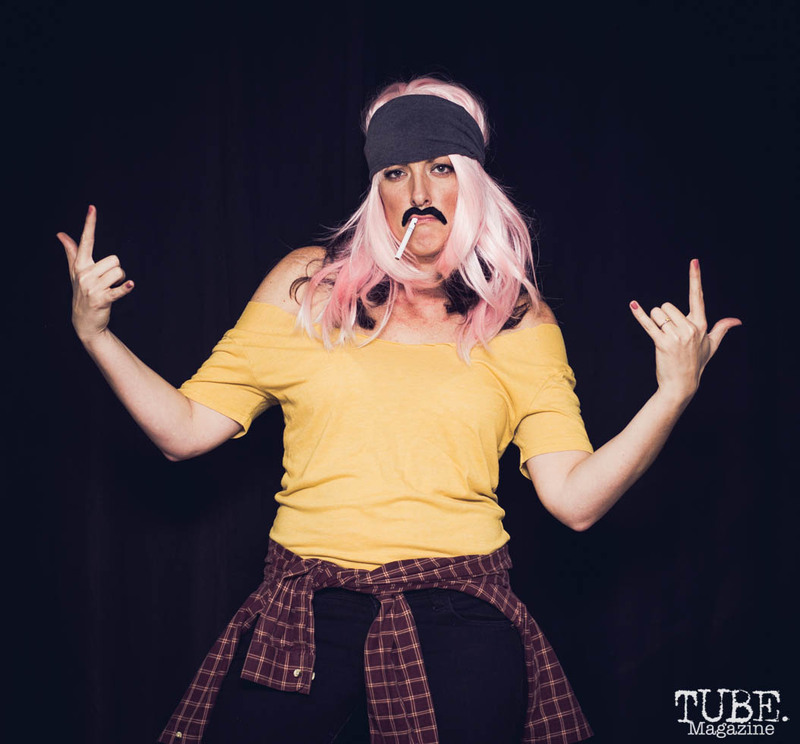 Most clever DIY costume will win a years subscription to our print edition of TUBE.! Winner announced November 3, 2015. Best of luck! Happy Halloween! Tags: cheap costumes, cheap halloween, costume ideas, DIY, diy costumes, diy halloween, do it yourself costume, easy costumes, halloween ideas, happy halloween, inexpensive costumes, inexpensive halloween, make a costume, Sarah Elliott, TUBE, tube mag, tubemag. Bookmark the permalink.